BIG LOTS was a little low on inventory, but seeing as how I was already cut from work and had nothing better to do I decided to invest in something far from the beaten path. 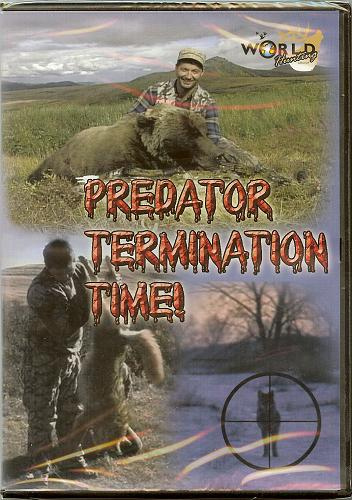 PREDATOR TERMINATION TIME! reads the DVD cover with a tasteful font designed to mimic dripping blood. The back of the box features photos of various predators such as coyote, bear, a bobcat (“This cat gets the shaft!”) and… an opossum? Laughably the opossum’s teeth are bared and a text bubble helpfully informs “I’m comin’ to eat you!” Keep in mind, this is the animal which famously plays dead at the first sign of danger. As we’ll see, however, even playing dead won’t deter these hunters from blowing your brains out. As for the film itself, there isn’t all that much narrative structure or suspense, per se, despite the narrator’s attempts to drum up the action with rhetoric about how predators and man are locked in a struggle for survival. So far as I can tell from this movie, none of these struggles ends with man getting eaten. The target of choice for these hunters is the coyote which for all intents and purposes looks, acts, sounds, and dies like a dog. The hunters attract the coyotes by mimicking the sound of a wounded rabbit (or calf or mouse, what have you). Inevitably the coyote comes in hopes of finding easy prey. Instead, they are shot and killed. In one of the most disturbing scenes a coyote is drawn into an open field. The hunter fires a shot, striking the coyote and sending it into a spinning frenzy. Ever see a dog trying to chase its own tail? It looks like that. In fact, the coyote’s tail is even wagging excitedly—or more like spontaneously due to nerve damage. Then a second shot rings out, again striking the coyote. The creature now stands quietly still and begins to lick its wound. A third shot and the coyote drops to the ground, dead. In addition to the coyote, black bears, bob cats, gray foxes, grizzlies, raccoons, and even prairie dogs are shot and killed with guns or bows. In one moronic sequence, the hunter uses prairie dogs for target practice with his bow, then in a fast paced chase sequence, sets his greyhound upon a coyote which, he notes, is out hunting prairie dogs! The lead hunter of the film is Tim Wells who looks in passing like a Baldwin brother. His climactic encounter is with an inland grizzly which he describes as a “monster.” Armed only with a bow and arrow (and an off-camera guide with a high powered rifle, for back up, of course) Tim charges towards the grizzly who is blissfully unaware of Tim’s presence. At the last moment the grizzly turns and looks at Tim who fires his arrow. The arrow pierces the grizzly through the skull and kills it instantly. This act of bravado is undercut by other scenes in which Tim hunts raccoons. He hunts at day time when raccoons can be found sleeping high up in the trees. Again, these are SLEEPING raccoons. Tim takes aim with his trusty bow and thump pierces the sleeping raccoon’s skull. It takes a few minutes for the animal’s body to fall out of the tree. I don’t see how one thinks of these people as anything but sadists. Even if the case can be made that someone or some mechanism needs to be put in place to curb the stem of predators like coyotes in certain agricultural regions, it takes a special kind of psyche to decide that YOU are the one to kill these creatures. I am not a vegetarian, much less a member of PETA. I watched this film while eating a steak—seriously. I suppose both the hunters and PETA activists could call me hypocritical. But if I am caught in a no-win middle, I am at least humbled by it. The hunters in PREDATOR TERMINATION TIME! seem only emboldened. After all, they’re the ones with the guns. You can check out their side of the story at http://www.worldhuntinggroup.com/.